ChromeOS devices are great in loads of ways, but they have built-in obsolescence. Google will stop providing updates at a predetermined time according to the schedule you can find here. So the best you will achieve is 6.5 year if you buy the device on the launch day. In reality, it will be generally much less. It's something to watch as a good deal might not be such a good deal if the device only has two years left. Put your device into Developer Mode. For most devices, this means hitting the ESC - Refresh - Power buttons. On some devices - like the Samsung Chromebox, the is a little dip switch to do it. 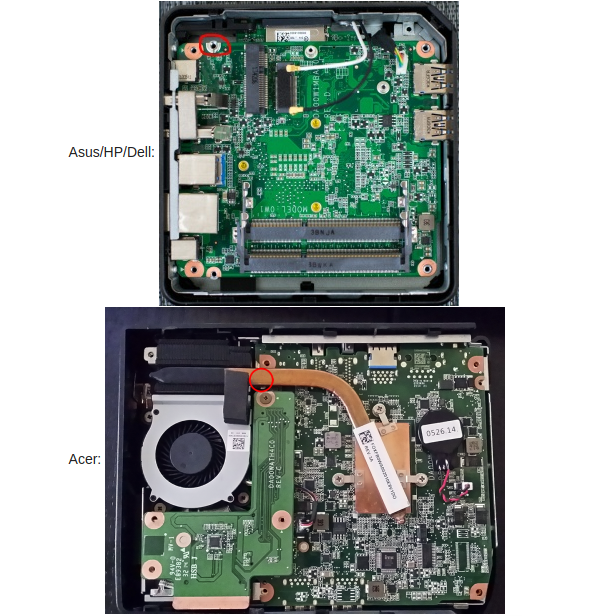 Either way, the device reboots and you get ChromeOS is missing or damaged. Hit Ctrl-D and follow the onscreen prompts. When the device reboots - hit Ctrl - D and the device boots into Developer Mode. If your device was managed - then make sure it is in an OU with forced re-enrollment turned off while you tinker. Once you have flashed your BIOS you can open this again. Reboot the device and log back in. The second one comes from MrChromebox.tech - the site gives lots of good information. You are now at the point of no return and can potentially brick your device. Follow the onscreen instructions to the letter. With the bios flash option FULL ROM should work with most devices - but check your one here (or at MrChromebox.tech if using that BIOS). Assuming you get no errors, you can reboot the device. ChromeOS has now gone! You need a bootable USB stick with your new OS on it. Could be Windows, Linux or Cloudready to go back to ChromeOS. Pop it into a USB port before you reboot. Reboot. Hold ESC down and hammer the "2" key. ESC selects the boot option and 2 is USB boot. If all is well, you should boot from the USB key and be able to install the OS. Once it is all working, I suggest you re-enable the BIOS lock. No support for ARM based devices - so Samsung 303's are toast. If you want to use the enterprise version of Cloudready, when you enrol the device, it will use a new ChromeOS licence - its seen as a different device. Over the coming year, I'll be doing this on numerous Asus, Acer and Samsung Chromeboxes and LG Chromebases. All work absolutely fine - but are coming to the EOL date so there is is no need to accept planned obsolescence. Great guide, many thanks. I saw the video on your channel on youtube on the pixel with cloudready and looks absolutely great. I'm seriously considering putting it on my 2013 pixel. Do you mind if I ask a few questions? 1. Which have you found better ubuntu or cloudready? Any issues with either? 2. Do you have to flash a modified bios, and if you had a preference over mrchromebox or the Johnlewis one which would you choose? 3. I've galliumOS dualbooting on an Acer c720, which runs great, but when booting you've to choose with CTRL+D or CTRL+L, is it the same with cloudready, or does it just boot straight back into the OS. 4. Are there any other idiot proof guides you'd recommend. I used Ubuntu on it to start with and moved to Cloudready. Ubuntu worked OK - but the 32Gb drive meant it was a bit limited. You also need to setup custom screen resolutions and configure the top row on the keyboard - so a bit of manual setup. Cloudready does support Linux apps - so you do get the best of both worlds. The only down side is that on the current version of Cloudready is that it won't sleep - just shuts down. Yes you have to flash a modified BIOS - so on a Pixel, you have to take the back off and remove the BIOS lock screw. Mine is on the Johnlewis bios - not tried the other one. I've not seen any other guides - I just put this together from the bits and pieces I found online. Just remember, if you choose to flash your Pixel there is a chance you will kill it - unlikely - but possible. Good luck. If a user send an inappropriate email to a loads of people or get stung by some sort of email exploit you can quickly delete the email from all of the recipients using a GAM command. Step 1 - get the email header Go into Google Vault and search for the offending user or someone known to have got the message. Step 2 - find out who has the email Go into Google Vault and find the original message sent by the offending user. Look at the details to see who got it. Copy the list and dump it into a spreadsheet. Clean up to just a list of emails with a column header 'mail'. Save as a csv file. My favorite GAM commands - well a few of them at least! Where would be without GAM? Paying for expensive syncing tools or doing tedious manual tasks in the admin console. GAM can automate most things you might want to do in G Suite. So these are a few of my favourite commands - one I use either as part of a batch file - or just standalone. There are loads more - but these are ones that are used daily. where classes.csv is a list of classes you want to make. Macros in Google Sheets - a quick look.